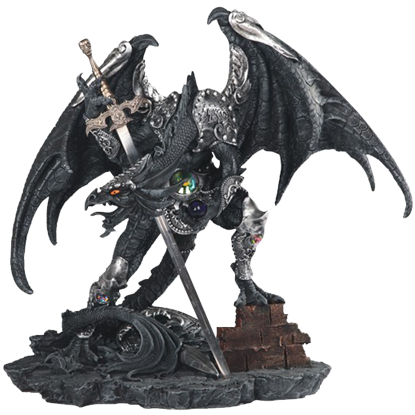 A feral look in its orange eyes and its maw open as if in a sinister snarling roar, the beast of the Armoured Black Dragon Knight Statue looks ready to fight any who threaten its prowess. Hand painting reveals extraordinary detail. With one claw clutching a massive sword, the other holding a mystical orb, this dragon is ready to protect its young. 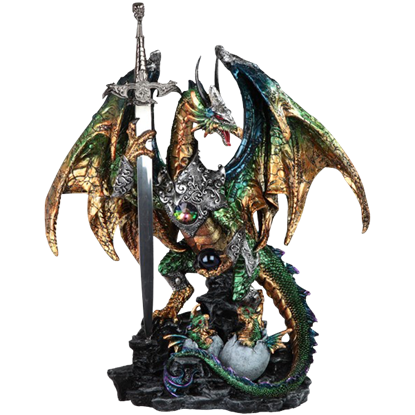 The Armoured Green Guardian Dragon Statue depicts this remarkably detailed warrior dragon, painted by hand. 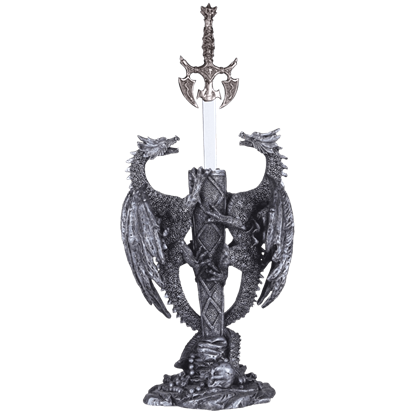 The double dragon letter opener is made of cold cast resin. 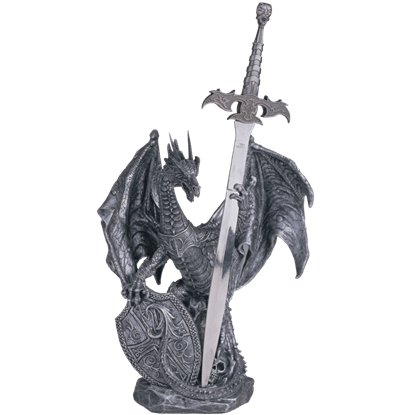 This letter opener features two dragons sitting back to back on a platform with their wings together. A jeweled sword that is used as a letter opener sits between them. 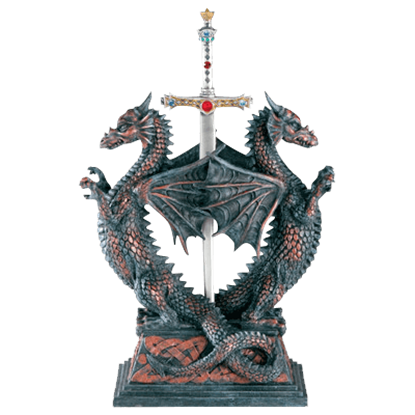 This dragon letter opener features two dragons, each gripping the sides of a medieval sword scabbard that can be used as a letter opener. The dragons wings are tucked in, and their tails cross over each others. 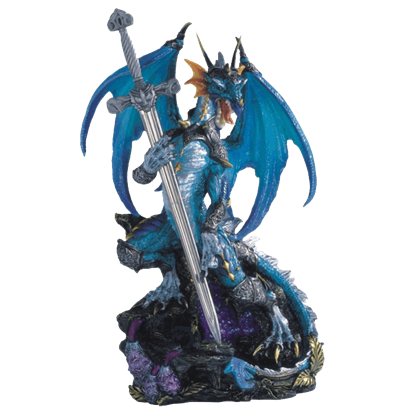 The Dragon and Skull Letter Opener is made of hand-painted cold cast resin. It features a dragon in armour standing on a platform surrounded by skulls. He holds a medieval sword in one claw and a shield in the other. 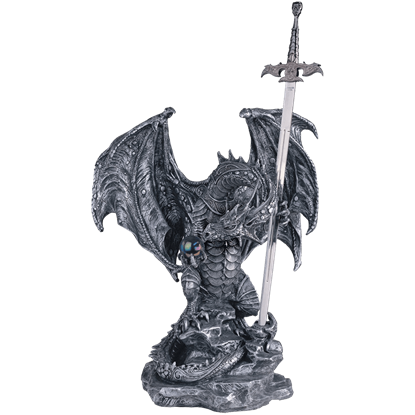 The Dragon in Armour Letter Opener is made of hand-painted cold cast resin. It features a dragon in armour perched on a stone platform, holding a medieval sword. 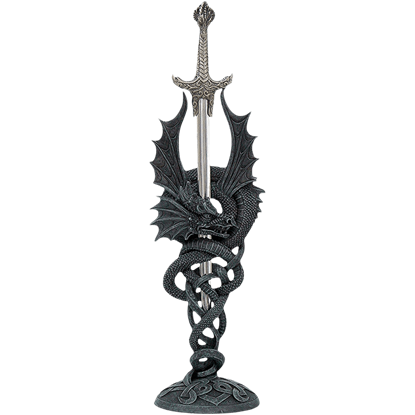 This dragon letter opener is a great addition to your collection. 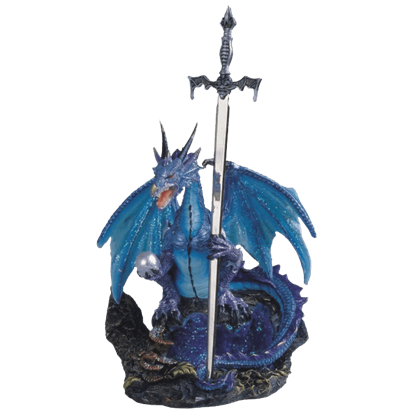 The Dragon Knight Letter Opener is made of hand-painted cold cast resin. It features a dragon in armour standing on a stone platform. He holds a medieval sword in one claw and a shield in the other. It measures 15 inches tall. 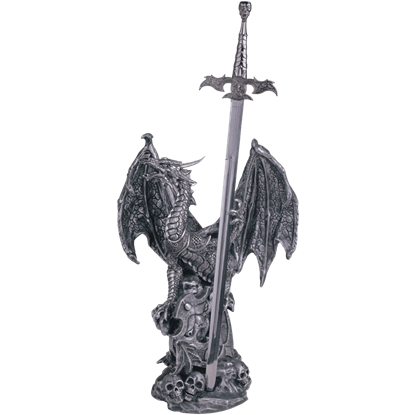 The Dragon Letter Opener is made of cold cast resin. It features a dragon in armour standing on a platform holding a sword in one claw and a blue sphere in the other. This letter opener is a great addition to your collection. In Celtic lore, the dragon is among the most powerful beings to ever roam the earth, many leaders featuring a dragon as a symbol their power. 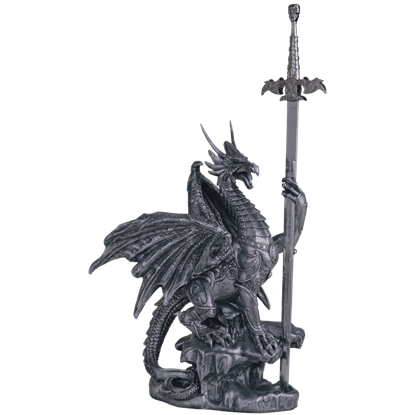 You too can embrace the might of this magnificent beast with the Dragon Wing Letter Opener! 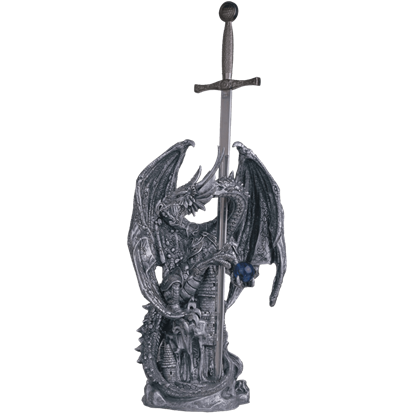 The Dragon with Sphere Letter Opener is made of cold cast resin. It features a dragon in armour perched on a castle holding a sword in one claw and a blue sphere in the other. This letter opener is a great addition to your collection.